Welcome to MakerSpace for the Humanities—the first integrated solution for teacher-and-student work in humanities research, thinking, writing and citing. AwesomeStories models research and storytelling and delivers rich authentic primary sources to inform and inspire new stories. Teachers and students explore, study, evaluate and select primary source media images, videos, documents and audios to construct new knowledge works using AwesomeStories apps. AwesomeStories MakerSpace consists of our free Archive of stories and primary sources; AssignmentMaker, the app teachers use to build or assign archive lessons; StoryMaker, the app teachers and students use to research, read and evaluate archive content, and to write cite and publish new stories; CurriculumMaker, the app that matches stories, sources and lessons to your school scope and sequence curriculum. I can't believe how fast and easy it is to use StoryMaker! I research the AwesomeStories free archive right from the app, write my story, enter links, note sources, and presto—I’ve created a multimedia story complete with beautiful images, videos and reliable citations ready for publication for learners and teachers around the world as well as my own students. It is so easy to make a story—finding authentic primary resources through the AwesomeStories archive or any of the over 100 linked world-renowned archives; reading and considering the subject; writing and citing. MakerSpace for the Humanities works for college and graduate students and also works for students as young as 3rd graders with some help from teachers or parents. Online reading and research is guided and fun. This helpful, reliable, engaging teaching-and-learning resource is free for all ... as it has been since 1999. Students encounter history, science, literature, the arts—and all other subjects—through topical story guides with embedded, curated multimedia primary sources. 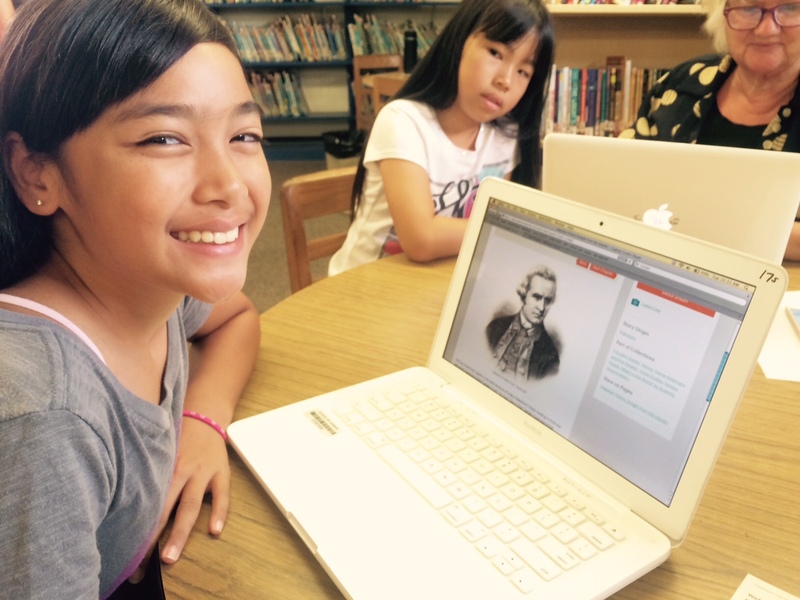 Students and teachers build and publish their own evidence-based multimedia content. Members access the Archive stories and primary sources and the database of 100 world-renowned archives to do deep reading, critical thinking, map-out ideas, write stories, craft papers, cite sources (properly) and ... publish. These skills meet goals required by today's careers, common core standards and annual assessments. Once teachers got their hands on the pilot version of our AwesomeStoryMaker app, "MakerSpace for the Humanities" was born. It became clear that teachers can produce not only stories to launch lessons and units, but digital curriculum. Students can create not only stories and articles but also term papers and group collaborative projects. Cite it properly (with respect and specificity). Links to more than 100 world-renowned archives. AwesomeStories is working with pilot schools to track the increases in student engagement, research, writing and critical-thinking skills. Now that students can research and build their own stories, these gains are expected to rise. And ... now that teachers can take their curriculum, put it into story form and build-out chapters with multimedia primary sources, some purchases of textbooks—and even e-textbooks—can be avoided. Teachers can then share with each other, their district or beyond. Most educators agree that STEM students need STEM MakerSpaces—support, plus tools—to explore their fields and to learn by making. Students at all levels in the humanities—not just language arts and social studies—need similar support and tools. Given the transformation of Internet-research access—coupled with the transformation of education and work—students need access to reliable archives, and scaffolding, to learn proper research-writing-citing skills and practices. The focus on STEM is critical for young people and our economy. STEM MakerSpace projects have brought inquiry-based and experiential learning to students who are now able to see future careers for themselves, motivating them to learn what is needed to reach education levels, career skills and eventual success as contributing members of society. In like manner, current Common Core and state assessments demand the same kind of critical thinking—not to mention research and idea-generation ability—in language arts, social studies, film, history, sports and the arts. Knowing how to ask questions, draw conclusions and articulate findings helps to drive understanding forward across the humanities. Teachers and students can use the archive, and the apps, to scaffold research, writing and citing. Students can complete papers or write stories. Teachers can write a story to launch a lesson, mount a unit or present an entire course in the multimedia, evidence-based story form. AwesomeStories welcomes collaborations with districts, schools, teachers, homeschool parents and students of all ages. Start Here or email [email protected] to learn more and for individualized support. Bond-Upson, Deborah "MakerSpace for the Humanities" AwesomeStories.com. Apr 26, 2014. Apr 24, 2019.